Search engine optimization is a methodology developed with the advent of the digital millennium. The purpose of search engine in the station is to design web content and information feeds that trigger a search engines search parameters in order to yield a higher ranking result in a search result page. The way this works is fairly simple to explain, but requires considerable learning to master. A search engine uses what are called keywords in order to search queries and sort the results. These keywords are given through user search input, and when the search engine performs said search, it pours through banks of text from the webpages it has mapped. Search results that contain higher counts of these search keywords are ranked higher in order when the engine returns search results to the user. This is what determines which websites are listed first in the queue when a user does a search with Google or any other search engine used in modern times. Some search engines also couple this with ranking and user input, but those are moot points compared to the importance and sensitivity of the keyword search system. These keywords are placed into web content in a variety of ways. One way is their inclusion in meta-tags, an element of web page HTML. However, this is rarely enough to accomplish the effect that search engine optimization aims to achieve. This is where SEO writers come in. A writer specialized in search engine optimization knows how to write informative, flowing content while integrating specific keywords organically throughout the document. These keywords will seem like they belong in the writing, as the writing is designed to support them. Therefore, these patterned keywords are not overtly visible for what they are, while the user reading the content is still informed of something useful. This strategy is encouraged by search engines, because without SEO techniques, they would not work very well themselves. To be a specialist in search engine optimization, one must have a knowledge of the language they are using, a skill for flowing, solid writing and an in-depth understanding of the workings of search engines themselves. This includes the ability to do keyword research, ranking measurements and also understanding the proper and improper roles behind the correct use of this system. A search engine optimization specialist enjoys, more often than not, a comfortable work at home career. They can make their own schedules for the most part, and work online in comfort. Many search engine optimization specialists work for freelance websites which connect them to buyers who need SEO content. It is quite lucrative, and an SEO specialist can earn enough to live comfortably, or even achieve moderate well if they are willing to put the work into it. However, to be a successful SEO writer, one needs a search engine optimization certification. In order to get this certificate, one must complete a search engine optimization course. The best way to do this is through online certification. Just like with the perks of working in SEO itself, online certification allows busy professionals to study at their own pace, in the comfort of their own home. But, some online certification providers are superior to others and following this logic, one must the better than all the rest. In fact, there is one provider that is far superior to any competition. Brainmeasures is the leading certification provider for search engine optimization. We work closely with skilled professionals in the field of SEO, and draw on their experience and knowledge so that our professional course designers can ensure that our courses are inclusive and convey a level of experience which in entry-level SEO writer with otherwise not have. 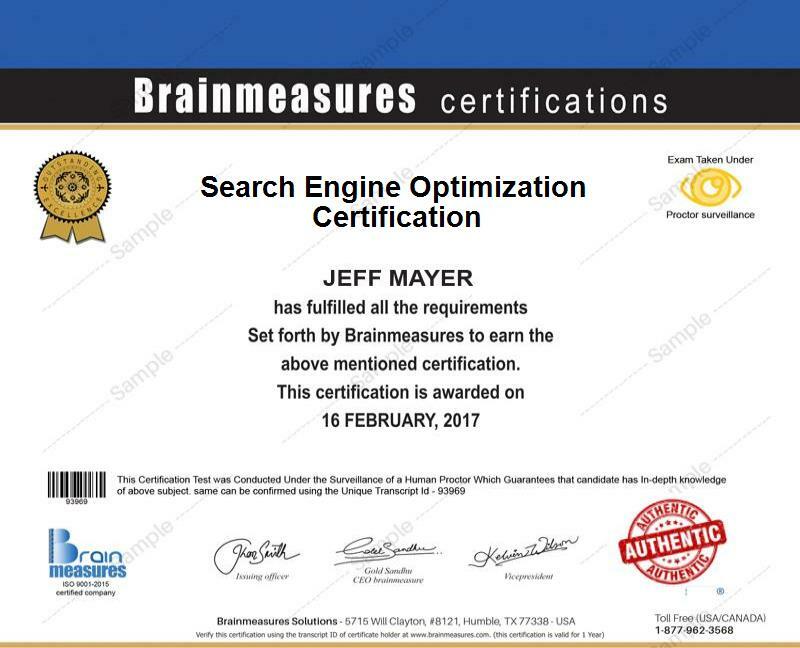 This means that a student graduating with a Brainmeasures search engine optimization certification is automatically more skilled in the field than any graduate from our competition. Not only can the competition not beat our course quality, but they can't beat our prices either. This consists of our cutting-edge search engine optimization course, followed by our online SEO exam. Upon passing the online SEO exam, we will award a certificate signifying a completed search engine optimization certification. This course is designed so that anyone with some technology savvy and a flair for writing could easily master this technique. This course can open up quite a few unique job opportunities, but since there are many SEO writers and other professionals who came into their field without this certification, many of these individuals stand to benefit from now taking the time SEO training. It is difficult to specify a salary range for freelance workers, and very few accurate measurements of that have been able to be made. However, a very reliable range has been established for those on long-term contract (while still freelance). These individuals can earn between $70,000-$230,000 a year, some of the more prolific earning up to $362,000 a year.